With the 36th Golden Raspberry Awards happening tonight, it's fitting that 2016's biggest bomb (thus far) arrives in theaters. Gods of Egypt is being called a disaster for Lionsgate. And it's expected to only pull in between $13 and $13.7 million during its opening weekend. On the other hand, Deadpool is poised to win it's third straight weekend in a row. There has been some controversy surrounding Gods of Egypt, with critics complaining about its whitewashed cast. The fantasy epic arrives amongst an Academy Awards show that is being boycotted for race discrimination. But one exhibitor told Deadline that the movie's failure to connect with audiences has nothing to do with the controversy or the #OscarsSoWhite Campaign. At the end of the day, it's speculated that audiences just didn't want a 'retread of Clash of the Titans'. Gods of Egypt only earned a measly $4.7 million on Friday. Deadpool, a movie that has already been in theaters for 15 days, doubled that amount with an $8.9 Friday gross. 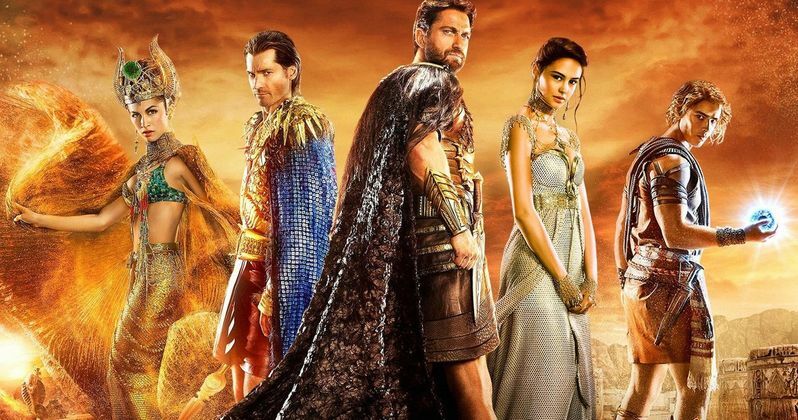 Gods of Egypt has a reported budget of $140 million, so this will be a substantial loss for Lionsgate. One they were worried about weeks before it opened. Earlier this month, during a Wall Street call, Lionsgate blamed The Hunger Games: Mockingjay Part 2's unexpectedly low box office returns on the double whammy of Star Wars: The Force Awakens and the Paris terrorist attacks, which they claim kept returning costumers away from their franchise ending sequel. During the Wall Street call, Lionsgate executives tried to convince investors that Gods of Egypt was going to be a surprise hit, and championed the tax credit it received for shooting in Australia. The movie isn't completely doomed yet. While it opens overseas this weekend, there are some major markets it hasn't hit yet. And it will open in China on March 11, which has been a saving grace for some previous big budget movies that haven't opened well in the states, such as Terminator Genisys and Pacific Rim, both of which are getting sequels thanks to their performance in that country. Before it hit theaters this weekend, Lionsgate shelled out big bucks for a pre-show Super Bowl ad that didn't resonant with the home audience. What is resonating with audiences is 20th Century Fox's X-Men spinoff Deadpool, which is expected to pull in another $31 to $31.5 million dollars over these next three days. The film has earned $263 million domestically since its release in Thursday preview shows on February 11. It has pulled in $529 million worldwide. And it shows no signs of slowing down. The character's solo adventure has earned more than any previous X-Men movie, with Wade Wilson proving to be even more popular than Wolverine. Also opening this weekend to very lackluster numbers is the olympic biopic Eddie the Eagle, which is estimated to take 5th place with $5.6-$5.8 million dollars. This is off of a $35 million budget, and can be chalked up as a loss for Fox. This weekend's other big movie, Triple 9, is in a similar boat. Though it should rest easy at number 3 at the box office, it is also being considered a loser for Open Road with an expected weekend take of $5.8-$6 million. The question becomes, can Deadpool hold onto a fourth weekend win with such little competition? Gods of Egypt star Gerard Butler has his second big movie of 2016 opening, with London Has Fallen predicted to knock Wade Wilson out of the top spot. Also opening next Friday is Disney's animated animal comedy Zootopia, which could be a big box office hit, especially since theaters are in high demand of a great family film. Don't expect Whiskey Tango Foxtrot, starring Tina Fey and Margot Robbie, to shoot too far up the charts though. So, what do you think? Did you see Gods of Egypt this weekend? And is it really as bad as all that?